I love this shot because it shows the poppies lining my walkway all the way back. Below the Showy Penstemon is a monkeyflower bush. And there are still more flowers to bloom this season! It may not seem like it looking at these photos, but I actually have had trouble keeping Penstemon spectabilis alive. I’m am almost sure the problem is too much water. I mean, they look lush and as if they want water. But, I don’t think so. I took these shots this morning because I liked how vibrant the color was with the sunlight slanting in behind them. The time of day makes the flowers seem to glow! Then I took a couple close-ups because the flowers are so interesting to look at. Plus, knowing me, I’ll kill this one soon overwatering it. I planted this penstemon in Fall of 2016. So it has been in my garden for just about a year a half. It was very small when I bought it, probably six to eight inches. It is now pretty close to 4 feet tall, I’d guess now. 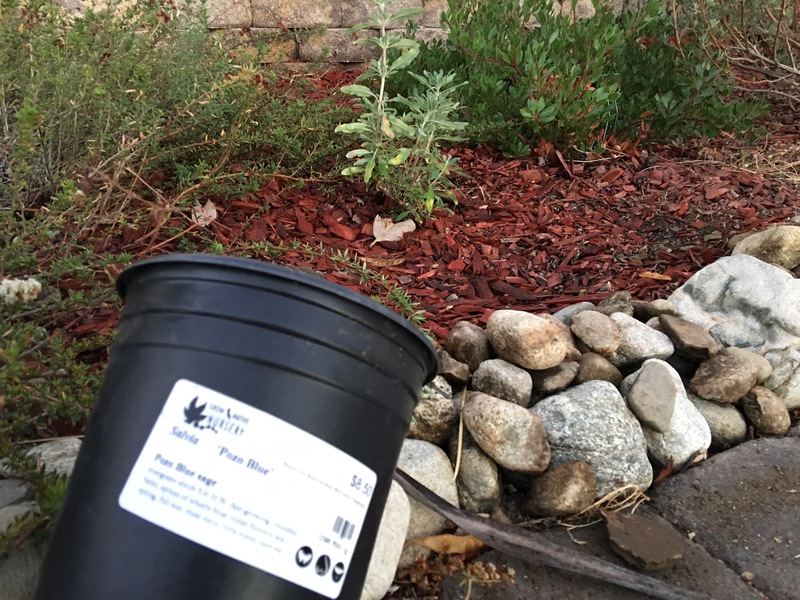 I got a few packets of wildflower seeds from my favorite nursery, Grow Native at Rancho Santa Ana Botanical Gardens in Claremont. This lupine is from those seeds. I only had poppies last year. I’m enjoying watching the wildflowers grow this year. Part of my plan is that these wildflowers will help crowd out weeds. It has been a struggle to eliminate weeds from the garden. There was a time when the entire yard was all weeds. I have tried using mulch and removing weeds by hand. I will admit to using some Round Up but it’s difficult to use around my plants. Wildflowers should help by both crowding out the weeds and also by helping establish the underground microorganisms that feed the native plants. In the meantime, they are beautiful to see. A friend suggested posting something each day, even if it wasn’t much. I am going to try something similar. I have been very interested and amazed to see the changes in my garden. Spring brings on new growth, blooms, and color. And this is the third year many of my plants have been in the garden. First they sleep, Next they creep. Third they leap! This is, I am told, an old adage among gardeners and has mostly been true in my experience with this garden. Most of my plants barely grew at all the first year. Little buds here and there. So, this being the third Spring, I’m seeing some good growth in many places. I’ll try, if nothing else , to post a picture and a sentence or two about it. At least 3 per week. More if possible. Why? I don’t know. Why not? I had some physical limitations get the best of me over the winter. I’m limited in some activities, like lifting heavy objects or bending over. That makes garden chores more difficult. Or expensive. It cost me $60 for my son to help me weed this month. I don’t mind paying him. He’s doing a lot of work and he does well at school. So, he deserves some pay. I could not have done it without him. Please enjoy these pictures from my garden in the last week. California Poppy “‘Mahogany Red” from seed. Below is my stream area. White Sage, Upright Rosemary, California Morning Glory, some succulents, Jelly Bean succulent, Firesticks, and some other succulents. I’m not so knowledgeable about the succulents, I admit. Above, a wide shot of my garden showing my California Buckwheat, Eriogonum fasciculatum. There’s a big bunch up front, behind that, and another to the right. Up front is also Penstemon “Margarita BOP”, some black sage, white sage, Bee’s Bliss sage, ceonothus, manzanita. Below, Penstemoncentranthifolius ScarletBugler with some buckwheat creeping behind it. I didn’t plant this. It grew from seed from another plant! California Morning Glory Calystegia macrostegia and a California Golden Poppy. Below, some wildflowers from seed I got from Grow Native nursery at Rancho Santa Ana Botanical Gardens. Also, I think there’s a Margarita BOP penstemon at the bottom. I swear I thought that thing died. Note to self: ignoring plants seems to help them live after a point. Below, a black sage with blue flowers (all my other black sage plants have white flowers), poppy, and California Sagebrush. On October 21st, the Rancho Santa Ana Botanical Garden’s nursery, the Grow Native Nursery, and my favorite place to buy plants, had their annual Fall Planting Festival. As a member, I got to go in at 8 a.m. with other members and pick out plants early. I had done my research. I lost a good number of plants this summer. I lost four “Winnifred Gilman” Cleveland Sages, several White Sages, a couple Penstemons, all four or five sticky monkey flower plants, a “Canyon Sparkles” manzanita, and a Desert Willow. I might have left some out, but that’s what I’m remembering now. My research was to find the plants that are not only native to California, but native to the same kind of area in which I live. The site for Las Pilitas is a treasure trove of information. There, I learned that my area is a Chaparral plant community. I had previously thought it was Coastal Sage Scrub because Las Pilitas said my zip code was in that area. But, I live in the “Inland Empire” a region characterized by heat and wind and little rainfall. We are in the foothills of the San Bernardino mountains but my elevation is about 1500 feet. So, although this might be a Coastal Sage Scrub area, the heat and wind means the plants need to be able to put up with all of that. And, as I look at the areas of land that aren’t developed, it most resembles a Chaparral area. The Coastal Sage Scrub (CSS) is a cooler area. And, the plants get a significant amount of fog that drips on them and is a source of moisture, while the Chaparal plants have to deal with more heat and little to no fog. The Chaparral community gets around 15 inches of rain per year, maybe slightly more than that. Accordingly, I used Las Pilitas to find plants that do well in that environment. There’s some cross over between Coastal Sage Scrub and Chaparral among plants. Salvia “Pozo Blue”; a Cleveland Sage cultivar introduced by Rancho Santa Ana Botanical Gardens. 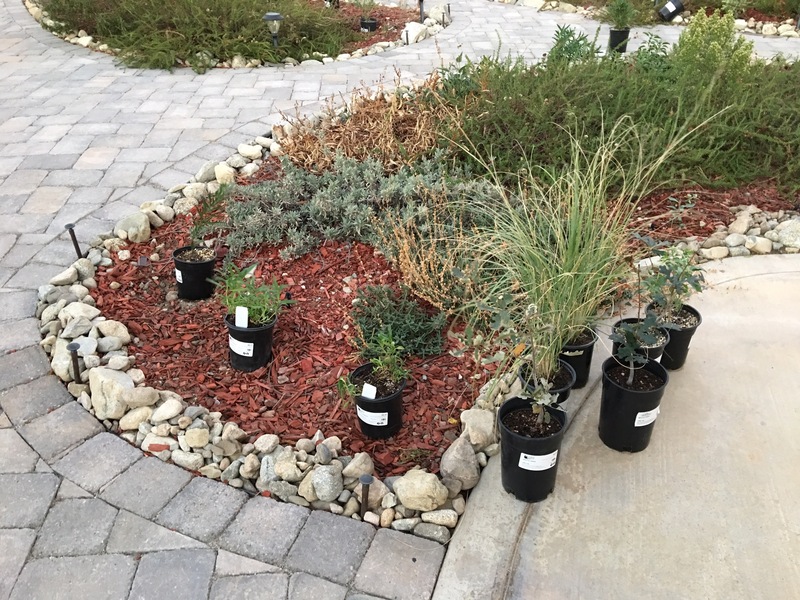 I tried hard to choose plants that deal well with heat and dry conditions. I made my list, considered where I would put such plants, and I picked out 47. It was a lot of plants. In fact, at checkout, I had no less than three people say, “Is this all one order?” Because it was unbelievable that one person would buy so many plants. There seem to be two schools of thought, for planting California natives. One group says you should only plant when weather is cool as in Fall or Winter. Late fall is best. I agree with this. But Las Pilitas says you can plant all year long if you want to as long as you are willing to make accommodations for your plants, like watering them. That being the case, I planted 19 last weekend. To me, it’s better to have a plant in the ground than in a plastic pot. But, disturbing the roots, as planting can do, is stressful to the plants. That’s why planting in the heat can be harder on them. That weekend and the last week have been hot, though. Very hot. We went over 100 degrees a couple days in a row. And then the wind was awful, too. In fact, the weather was ugly all together. Heat, wind, and extremely low humidity. Also, the high pressure in the atmosphere kept the heat trapped. So, for several days in a row, the temperature didn’t drop below 85 degrees, even at night. Heat, low humidity, high wind, and no cooling at night? Brutal for new plants! 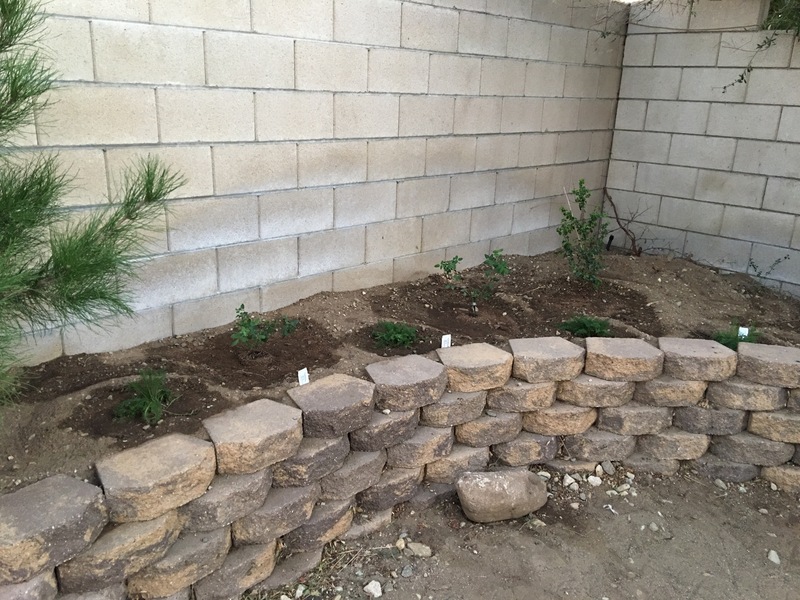 Finishing the corner, I planted California Wild Roses, Cherry Holly, and yarrow. 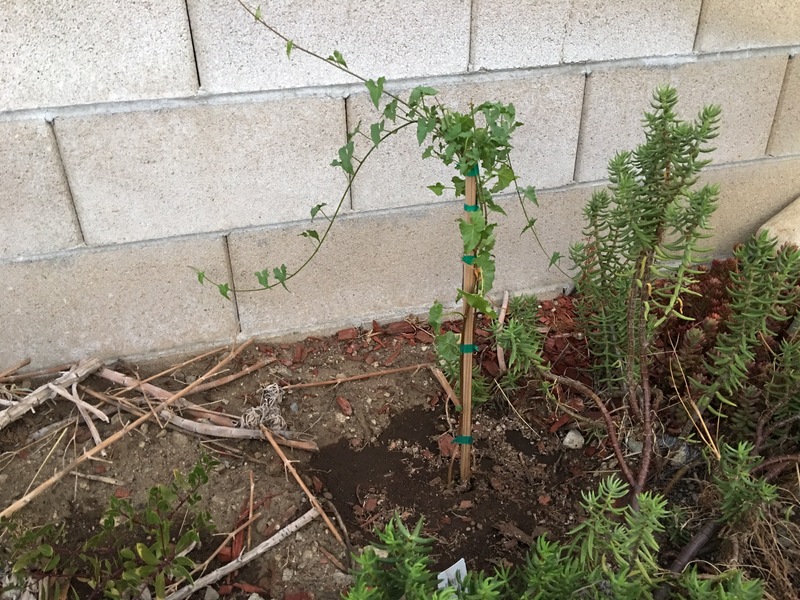 California Morning Glory, a vining plant. I’m really looking forward to it spreading across the wall and covering it with pink/white flowers. Last year, I watched as a beautiful Grinnell’s Penstemon withered and died over a timespan of about two weeks. It had spread to about 3 feet wide since I planted it, starting from 6 inches high and barely five inches wide. It had bloomed during Spring and looked completely healthy and happy. I guess it makes me feel a little bit better that even someone with a formal education in gardening/botany can be as mystified as I am. But, it’s also a little bit frustrating. How are we supposed to keep our plants alive if even experts aren’t sure how to do that? I’ve lost several plants this summer. Heat? Gophers? Disease? Too much water? I just don’t know. The casualties (so far, the summer ain’t over…) as of today: two penstemons, three monkeyflowers, a desert willow, a black sage, a ceonothus (that I moved after it sprouted from a seed dropped from another plant), two other ceonothus that I bought, a Jeffery pine, a couple of dudleyas, and a manzanita. The weather is supposed to be cooling off. Today the high temperature was supposed to be 95. It’s currently 102 degrees in my yard as I write this. That’s hardly cooling off! Then again, we live in the Inland Empire, a region of heat, wind, blue skies and sunshine. And, I just read on my favorite weather blog, Weather West, this has been the hottest summer ever on record. It shouldn’t surprise me, I guess, that the summer just refuses to go away.